I think that this is an interesting comparison made by Leon F. Seltzer at Psychology Today [read more here]. Revenge is predominantly emotional; justice primarily rational. and both a social and legal phenomenon. Revenge is an act of vindictiveness; justice, of vindication. Revenge is about cycles; justice about closure. Revenge is about retaliation; justice about restoring balance. 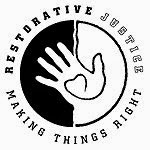 I think that the heart of justice is restoration and reconcilation. Consider these passages from the bible. I love the way that these verses paint a picture of justice that is restorative in nature.